Back in 2005, the 60th anniversary of the end of the Second World War, the Russian government spared a thought for war veterans and their widows, and they were promised comfortable homes or money to buy them. Immediately, suspicions arose that officials would drag their heels and sabotage this programme; given that more old soldiers die off every year, delays could mean budget savings. TV reports showed veterans living in semi-derelict shacks that the local authorities claimed were perfectly habitable. In 2011, just before the 9th May Victory Day celebrations, the story of Vasily Zasorin from the Voronezh region hit the screens. The almost blind, 87 year old veteran had lived for 50 years in a crumbling house without running water, plumbing, gas or central heating. A committee from the district council had inspected his leaking ceiling and broken stove and declared it fit for habitation. Before Victory Day, the local authority decided to award Zasorin 1000 roubles (£20). 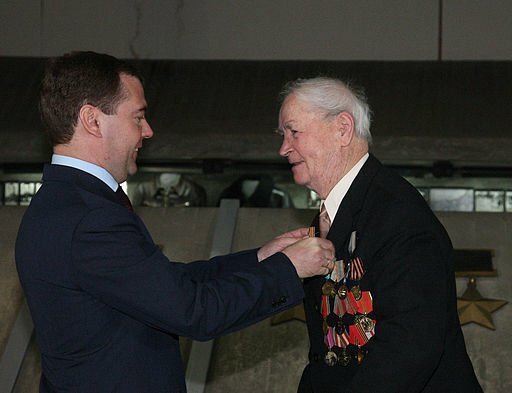 He threw out the officials who brought him the money, packed up his military decorations (two orders of merit and 15 medals) and posted them to Vladimir Putin in Moscow along with a letter in which he had written, ‘We defeated the Fascists, but we haven’t been able to defeat our own bureaucrats, who treat veterans worse than our enemies’. Vasily Zasorin, an almost blind 87 year old veteran, had lived for 50 years in a crumbling house without running water, plumbing, gas or central heating. A committee from the district council had inspected his leaking ceiling and broken stove and declared it fit for habitation. Many war veterans are still waiting for their promised housing, and many others have died waiting. In some regions local officials and judges also refuse to recognise a housing certificate, entitling the holder to a flat or a cash grant, as part of a dead person’s estate, and this has developed into a separate problem. Certain austerity minded local councils even recall grants from the deceased’s bank account, on the basis of ‘no person - no problem’. Take for instance this story from the city of Ulyanovsk, 900km from Moscow in the central Volga area. Anna Zabavnina, the widow of a WW2 veteran, died in July 2010 at the age of 83, four days before she was due to receive a certificate entitling her to 806,000 roubles (£16,000) to buy herself a flat. And even had she lived, she would not have been able to collect it herself, since she had been bedridden for three years, cared for by her son Yury, with whom she lived in a 9 m2 bedsitter without hot water. After a presidential directive in 2008, designed to speed up the provision of improved accommodation for war veterans, Anna was recognised as eligible for a housing grant. The local social services department then started hassling the Zabavnins to find somewhere to buy, since the money could only be released after a property had been bought. They found a one roomed flat that would be affordable if they sold their room, and meanwhile borrowed 100,000 roubles for the deposit. Yury, under power of attorney, looked after all the paperwork, and also collected the certificate after his mother’s death, convinced that he was entitled to it as her legal heir. But he was mistaken. Yury Zabavnin took the matter to his local court, but lost his case on the grounds that the certificate was made out to a named person and couldn’t be transferred to someone else. He appealed to the regional court, which upheld the decision, as did the Supreme Court later. Legal rights consultant Georgy Chabanov has however advised Yury and Galina to continue to pursue their case through the courts on the grounds that the Ulyanovsk authority’s ruling is unlawful. Judicial practice on the question of inheritance of social welfare grants does indeed vary across Russia. A regional court in Kostroma, in a similar appeal case, ruled that ‘the right of the deceased to receive and use a grant arose while he or she was alive.’ This is a much more logical interpretation of the law. Courts in the Krasnodar and Samara regions have also ruled in favour of families. In Krasnodar the money is first deposited in the recipient’s bank account and then inherited by his or her heirs, but in Samara the ruling states plainly that ‘In the case of the recipient’s decease, the grant is transferred to his or her family in accordance with the Civil Code’. Regional bureaucracies, in other words, vary in their generosity or miserliness when dispensing funds from the federal budget. Why Ulyanovsk is so stingy is unclear, especially since the money has been ring fenced by central government, but perhaps it wants to win brownie points from Moscow for its thriftiness. Apart from the legal question here, there is also an ethical one. Last year there were 3.4 million people alive in Russia who had fought in WW2. 2011 saw the death of 136,000 veterans, and in the coming years the number will go on dropping by hundreds of thousands annually. According to the regional Ministry of Social Development, in 2012 all Ulyanovsk veterans and widows identified as needing re-housing had been awarded, and presumably received, it. It has now been announced, however, that in 2013 the city will receive another 480m roubles, to house yet another 480 old soldiers. Which makes it even more inexplicable why its council is meaner than those in other regions. Certainly it doesn’t skimp on cash when it comes to its own image. For example, on 22nd January the London gallery of MacDougall’s auction house launched the International Arkady Plastov Fine Art Award, named in honour of the renowned Soviet realist artist who was born in the Ulyanovsk region 120 years ago. The 20m rouble (£400,000) award, the richest art prize in the world, is intended to promote and support figurative art and artists. At least half the prize money will come from the regional government, which has angered its critics, who feel that a region in receipt of central government subsidies shouldn’t be squandering cash on this kind of thing, especially without even seeking the agreement of the local parliament.